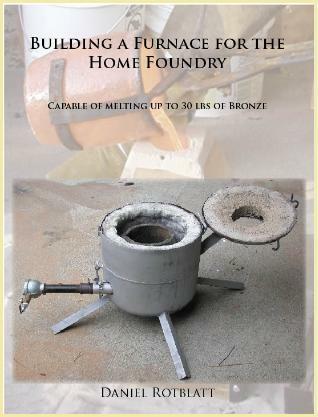 This article is an account of constructing a small bronze casting furnace. I am putting it here for educational purposes only. Should you attempt to build a furnace like this one, I am not responsible for ommissions, mistakes, or errors that may lead to injury or death. Building and operating a furnace without proper knowledge and a good dose of common sense can lead to injury or death! Read up on safety procedures before using this or any furnace. Dangers inculde propane explosions, severe burns, carbon monoxide poisoning to name a few. To start, take a look at my safety page and Furnace Lighting Procedures. I'm also a blade-smith and have made several forges using similar materials and techniques as this furnace. The main difference is a smaller sized freon tank rather then the 5 gal propane tank. I was invited to teach a seminar on furnace building for a foundry class at El Camino College. I took pictures during the seminar and combined it with pics of my own furnace to create this article with the intent of using it at other seminars. Thus it is written as a "How To" article, meant to be combined with the seminar, which includes discussions on safety and proper use of the furnace. 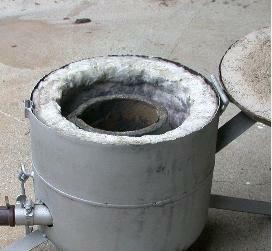 This furnace is able to melt 25 lbs of bronze in about 30 minutes. It has a maximum capacity of 30 lb. of bronze or 10 lb. of aluminum (a #10 crucible just fits). The pictures here are from a class I did where we built 3 furnaces. Think of this as a recipe for building the furnace, there are many variations you may use depending on our skills, the tools in your shop and availability of materials. If you follow certain basic principles the furnace will work just fine. 1) A furnace body is mainly an enclosure to hold the heat that the burner puts out. The steel shell does not hold in any heat, it is the refractory that holds in the heat (the lining inside the furnace shell). 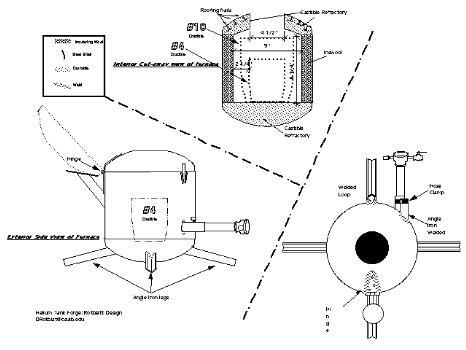 The body could be made of screen and it will work the same, it’s only purpose is to hold the refractory in place. 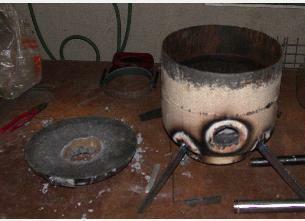 2) The burner should come in at an angle (see diagram #1) so the flame forms a vortex or whirlwind around the crucible. 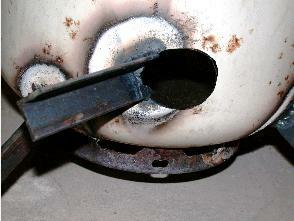 This distributes the heat evenly and does not overheat the side of the crucible. 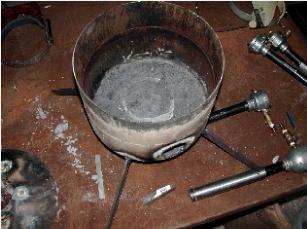 3) The refractory you use must be able to take the heat within the furnace. Bronze is poured at around 2100 degrees F, but the furnace lining (especially where the flame is hitting it) gets much hotter. The lining on my furnace should take 2700 degrees. You cannot use plain concrete or substitutes, this can be dangerous. 2300°F ceramic blanket can be used, but expect a shorter life. 4) Every place there is a leak (i.e. 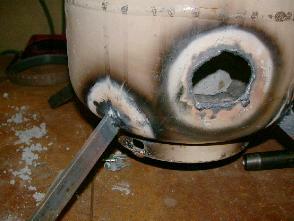 flame shoots our from a hole or gap in the refractory) heat is lost. The less holes there are the better, but NOT from the point of view of melting the metal. The amount of heat lost from a small hole or two in the furnace is nothing compared to the amount of BTU's (heat energy) the burner puts out. The danger is that a flame shooting out the side will catch something on fire or worse, burn a hole in the propane line. Therefore, you should make the lining fit well - an easy thing to do, especially with ceramic fiber and castable refractory. 5) There must be a hole in the top of the furnace to prevent back-pressure from building up (especially important with a venturi burner). This hole also allows metal to be lowered into the furnace with a pair of tongs (not dropped!). 6) You must have a burner able to generate enough BTU’s (heat energy) to heat up the furnace to the temperature you want faster then the furnace looses heat to the outside. In an ideal world, a perfectly lined furnace (one that lets no heat out at all) could be heated to 2000 degrees F from a flame no bigger then a candle. In reality the flame must be a bit bigger to do this. The burner in this furnace puts out between 135-200,000 BTU’s. The steel body is made from a party helium tank (it is the same size as a 5 gal. propane tank but helium is nonflammable). The bottom and top are lined with a castable refractory, and the sides are lined with Ins-wool or any ceramic fiber blanket that will take 2300°F. 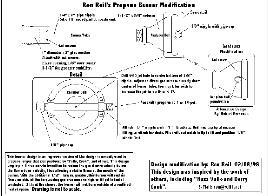 The burner is based on Ron Reils EZ-burners - the plans are on the internet and highly recommended reading. They are updated frequently and should be looked at. This list of tools and parts is off the top of my head, but should be fairly complete. There is always some latitude, since many of the parts can be made from scrap laying about the shop. 40" x 10" Ceramic fiber blanket (2700°F maximum temperature preferred, name brands are Inswool or Kaowool). 1. Using a cutting torch, cut a hole in the top of the helium tank about 4 1/2” in diameter (the exact size is not crucial). 2. Cut off the top of the tank just below the curve of the lid. Two views of the helium tank cut off around the rim. On the right you can see the hole cut in the center of the top. 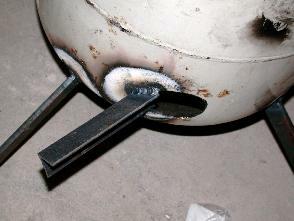 Note the placement of the legs, hole for the burner, and hinge. 1. On a flat surface, place the bottom of the tank on a brick and weld the 4 legs onto the bottom/side of the shell. 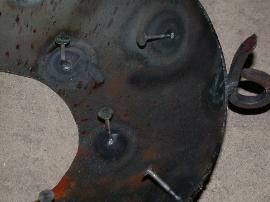 Before welding sand off the paint where the welds will be using an angle grinder and sanding disc. 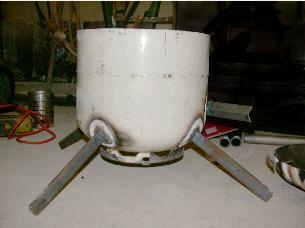 A side view of the bottom half of the furnace showing the legs welded in place. 1. An oval hole is then cut in the side of the shell about 4” above the very bottom of the shell. This can be done when cutting off the top since an oxy-acetylene torch is best for this. The hole should be about 1” tall and 2” wide - better too big then too small. Test it's size with a 3/4" pipe, view the plans above and diagram #1 for positioning. 2. A 4” long piece of angle iron is welded to the edge of the hole. 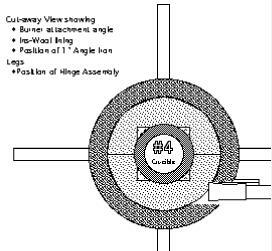 It should be angled as shown in "diagram #1" at the top of the page. The burner will be attached with a hose clamp to the angle iron. Here's a view of the hole cut with an oxy-acetylene torch. The hole should be set about 1" above the curve of the bottom of the tank. A 4" piece of angle iron has been welded to the side of the hole. The hole has been cleaned up with a grinder. 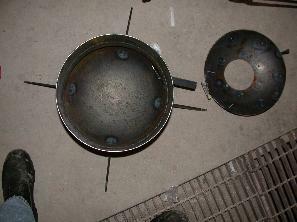 A top view showing the angle of the burner. 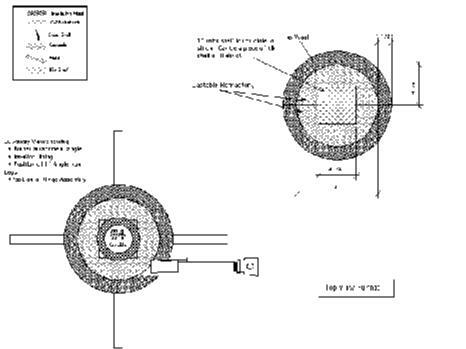 Look at Diagram #1 at the top of the page to see how the burner should be set. 1. Weld a number of roofing nails onto the inside of the top to hold the refractory. 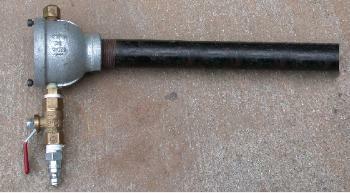 A hinge was welded to one side and the loop/latch to the other (a detail of making the loop is shown in below). A close-up showing the roofing nails welded in place. The loop is also shown to the right side. 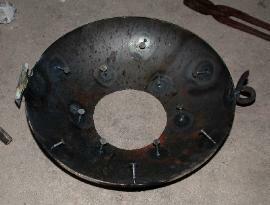 A view of the lid with hinge, hook, and nails. It is ready for the refractory to be poured in. 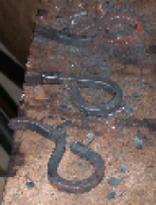 A close-up of the loops ready to be welded to the front of the lid. You only need one. 1. 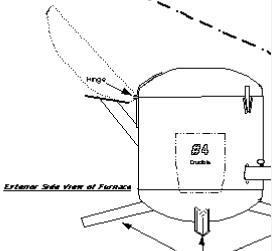 Castable refractory is used to line the bottom and top of the shell. It should take at least 2600°F and should be about 2-1/2" to 3” thick on the bottom. 2. Make a cardboard ring the size of the hole in the lid and tape it into place with duct tape. Also make a 2" thick ring of cardboard and set on a piece of wood. This is to make a base block to put the crucible on. 3. Mix enough castable for the lid and bottom, plus a little extra. 4. Fill the lid with refractory cement. 6. Use any extra to make a base block. Harbison Walker should have outlets in all the major cities - they are a worldwide manufacturer. Look up refractories on the internet, or in a phone book for local dealers. Inswool can be purchased by the linear foot from the following websites by the linear foot (it comes 24" wide). Also look on eBay - don't pay more then $6-8 per 2 cubic feet. I haven't purchased through the following, but the prices seem good. 5 foot lengths (10 square feet), about $3/sq foot. Enough to line 2-3 furnaces. By the foot for $8 a linear foot (2 sq ft). 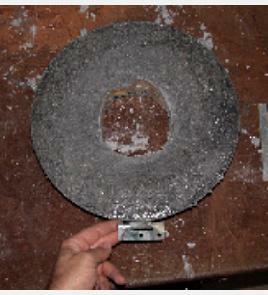 A piece of cardboard is bent into a circle and taped in place with duct tape. Castable is poured into the top and smoothed. Here the bottom is poured. In this furnace I made an integral base block, but I recommend making it separate so it's easy to replace. 1. When the cement is dry, place the lid on the body and weld the hinge to the body. 2. The loop has a bar which will stick down along the body. Weld two small bars to the body on either side of the bar. This will align the lid when it is closed, while the loop can be used to lift the lid with a hook. 2. Cut a small piece of angle iron (about 4” long) and weld it to the shell so the top rests on it when open. Cut a disc of scrap sheet metal and weld it to the top of the angle iron rest (this helps prevent the angle iron from denting the top and eventually cracking the refractory). On the left side of the furnace is the lid rest welded below the hinge. 1. Cut a piece of 1" ceramic fiber blanket about 9" (measure the inside height of the furnace) by about 40". Make sure it is long enough to fit tightly inside the furnace body. Use a sharp knife or matte knife to cut it. The dark ring shows the Ceramic Blanket lining. This shot shows the Ceramic Blanket lining. In this case I think I used 2" blanket (the inside measures 1-1/2", 1" is sufficient and leaves more room for a crucible. 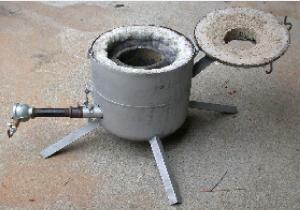 I used the Ron Reil Burner shown below with the Bordeaux modification. Instead of a short flared pipe shown at the end of the burner in the plans, I used a 6” long pipe that is attached permanently to the furnace with a hose clamp to the angle iron that is welded to the shell. The end of this pipe is flared. The burner is held in the flared nozzle using a setscrew. Once the burner is set the right amount into the 6" flared end, mark the burner pipe or put a hose clamp around it to act as a stop. A #60 drill, taps, etc. can be purchased at OSH (Orchard Supply Warehouse). Click on this schematic for a larger view. Yup, it melts bronze. That's a #10 crucible in there. 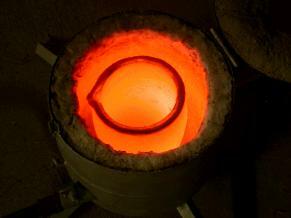 I've done dozens of pours over 20 lbs, and many smaller pours out of this furnace. I've recently noted that I'm getting a lot of hits on this page. If you've built one of these furnaces, or have questions, please drop me a line and give me some feedback!